The Masked Bees get their name because many species are black with bold yellow or white markings on their faces. They may also have a large yellow spot on the top of their thorax. Above: this beautiful photo by Erica Siegel clearly shows the yellow markings on the face and thorax of this Masked Bee. 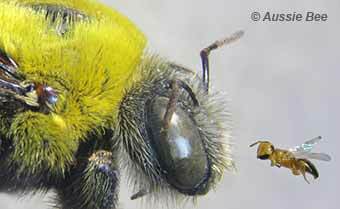 Most Masked Bees are slender and less than 10 mm long. They have smooth, almost hairless bodies; so they can look rather like wasps. 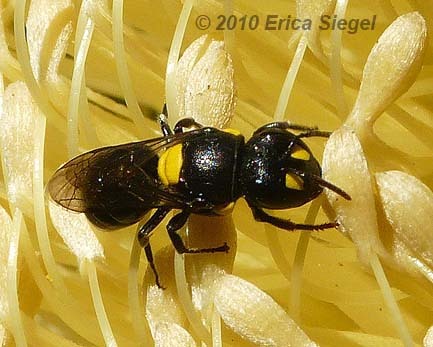 However, they are true Australian native bees, collecting nectar and pollen to feed their young. They carry pollen back to their nests by swallowing it. Above: a slender smooth Masked Bee collecting nectar from Eucalyptus blossom. They usually build solitary nests - each female bee raises her young in her own nest burrow all by herself. They excavate narrow nest burrows in pithy stems or use pre-existing holes in timber or other materials. Similar to other bees in the family Colletidae, they secrete a cellophane-like material that they use for nest building. Some Masked Bees will build nests in narrow drilled holes in Bee Hotels. You can recognize the nest of a Masked Bee because, when the nest is finished, the bee seals it with a silvery translucent cellophane panel. 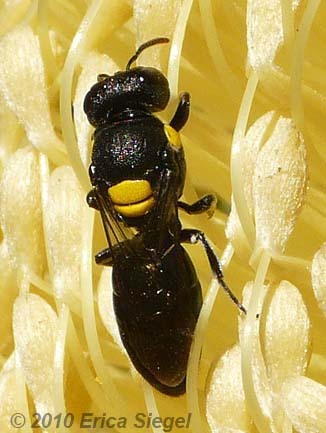 Masked Bees are found Australia-wide. 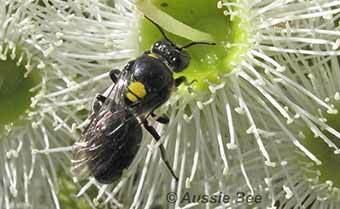 Two species of Masked Bees with particularly interesting stories are the Wasp Mimic Bee and the Banksia Bee. 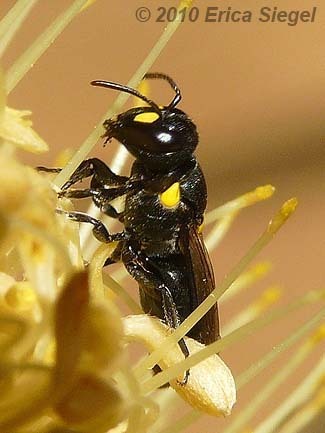 Above: this Masked Bee is an Australian native bee belonging to the family Colletidae. Photo by Erica Siegel. Above: these bees are called Masked Bees because of the bold markings on their faces. Photo by Erica Siegel.